Galaxy Note 7 storage starts from 64 GB with micro SD card support. 128GB version was not announced. But if sales go well (very hard, probably), Samsung may introduce 128GB version during the coming holiday season. Remember Galaxy Note 5 starts with 32GB storage, with no micro SD card support. Although 64GB version was announced at the same time, many vendors only stocked 32GB version in many regions. Micro SD card support in Galaxy Note 7 can be a deal maker. A lot of Galaxy Note 4 users refused to upgrade to Note 5 due to lack of SD card support. Samsung finally realized micro SD card support is still important (since Galaxy S7). 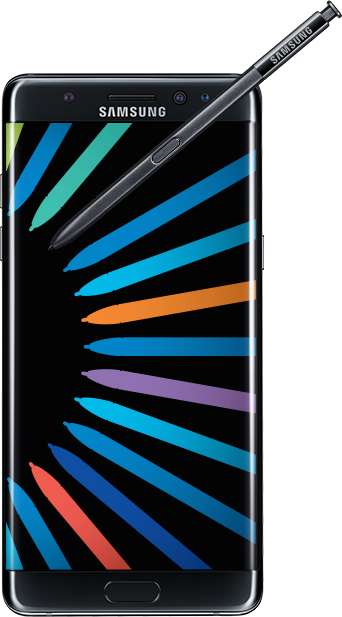 Galaxy Note 7 have a 5.7″ 2K QHD (2560*1440) Super AMOLED display. The size is similar to Galaxy Note 5, or 0.2″ larger than Galaxy S7 edge. But Galaxy Note 7 screen is curved on both sides. This means the writable area actually is smaller than Galaxy Note 5. For the screen quality, the improvements are beyond human eyes. Galaxy Note 7 is packed with a 3500mAh battery, which is 500mAh larger than that in Galaxy Note 5. But it is 100mAh smaller than Galaxy S7 edge. Same as Galaxy Note 5, Galaxy Note 7 battery is also non-removable. Anyway, removable battery becomes a luxury. Most flagship smartphones now only have non-removable battery. Galaxy Note 4 is the last Note with a removable battery. Galaxy Note 5 supports fast charging, wireless charging and fast wireless charging. All your Galaxy Note 5 chargers will work with Galaxy Note 7. But you have to change the micro USB cable to USB type-C cable. Samsung will give you an adapter to use the old cables if you want. Galaxy Note 7 has a dimension of 153.5 x 73.9 x 7.9 mm (6.04 x 2.91 x 0.31 in), which is 2.2 mm narrower and 0.3mm thicker than Galaxy Note 5, thanks to the curved screen. Galaxy Note weights 169g, which is 2g lighter than Galaxy Note 5. Anyway, you cannot feel the differnce. Galaxy Note 7 has identical camera modules as Galaxy S7: 12MP rear camera and 5MP front camera. FYI, Galaxy Note 5 has a 16MP rear camera and 5MP front camera. Don’r be fooled by the pixels. Galaxy S7 camera is one of the best smartphone cameras you can get in 2016. Galaxy Note 7 has a new security channel: iris scanner. You can authenticate yourself with in the blink of an eye. Also, there is an exclusive feature for iris scanner: secure folder. You can safely hide all your private or juicy staffs. Galaxy Note 7 S Pen and S Pen slot have similar design as those in Galaxy Note 5. The improvements include: 1). smaller S Pen tips; 2). you cannot insert S Pen in wrong direction any more; 3). S Pen and S Pen slot are resistant to water and dust. IP68 rating applies to S Pen and S Pen slot as well. All the goodies in WiFi, Bluetooth, NFC are kept in Galaxy Note 7. The major update is the USB type-C port in the bottom. Galaxy Note 7 is the first Samsung smartphone switching from micro USB to USB type-C. In Galaxy Note 7 box, Samsung will give you a micro USB type-C to micro USB adapter. So, don’t throw your old micro USB cables and accessories. Galaxy Note 7 comes with latest Android Marshmallow. Of course, Galaxy Note 7 will get Android Nougat update. The question is when. TouychWiz is further polished with better visual elements. But this is up to individual users. And Galaxy Note 7 also has edge screen features, exactly as in Galaxy S7 edge. All S Pen related apps: S Note, S memo, action memo and scraper, are now in one giant app: Samsung Notes app. You can now also pin a memo on lock screen or the always on display (AOD) screen. S Pen also get new gimmicks. In addition to all air commands, S Pen can now make animated GIF for any non-DRMed videos, pull Google translation for text you selected, and magnify a window. Samsung released the official infographic of Galaxy Note 7 specifications vs Galaxy Note 5 as shown below. Enjoy. Detailed Galaxy Note 7 guides will be released gradually. What’s your thought on Galaxy Note 7 specifications? Please share your thoughts with the community. Here it is November 2016…and I love my wonderful Note 7. Just picked up a brand new Samsung Lens Kit for the N7…and paid only $20! Got the cool Samsung LED case for $4,50 new. A new Samsung N7 screen protector for $3. The wireless charging pack cover for $12. NOW I have a SUPER N7 for peanuts thanks to all the people who ditched their N7 accessories. Tragic really. No better phone than the N7. But you will be in trouble when you travel with Note 7. Samsung also rolled out an update which limits the battery to 60%. Also some carriers will ban Note 7 on their networks. Anyway, it’s better to refund Note 7 unless Samsung finds out the causes. 18 Months later I still have and love my wonderful Note 7 and all of its great accesssories. I love the N7 more than my N8. But for the N7 being stuck at version 6.x.x, it is the better phone. On my S7 the mobile data is switched off, How do I turn it back on? Swipe down from top of the screen (status bar) to access quick settings buttons. You can tap the mobile data icon to turn on/off mobile data. You can also turn on mobile data in Settings–data usage.